Typically, the first time you connect a device that plugs into a USB port, Windows automatically installs a driver for that device. Drivers allow your computer to communicate with hardware devices; without one, a USB device that you connect to your computer—for example, a mouse or a webcam—won't work properly. Check the instructions that came with the device to see if you need to install a driver before connecting the device. Although Windows usually does this automatically after you connect a new device, some devices require that you install drivers manually. In those cases, the device manufacturer includes a software disc and instructions on installing the driver before plugging in the device. If your USB device came with software from the manufacturer, check to see if it's compatible with this version of Windows. If it's not compatible, or doesn't say which versions of Windows it's designed for, try plugging the device in first to see if Windows can find a compatible driver. If the instructions that came with your device contradict the information in this topic, follow those instructions. Most USB devices that have power switches should be turned on before you connect them. If your device uses a power cord, connect the device to a power source. Then, turn it on before connecting it. 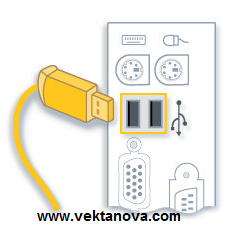 Plug the device into the USB port. If Windows can find and install the device driver automatically, you'll be notified that the device is ready to use. Otherwise, you'll be prompted to insert a disc containing the driver. After installation is complete, check the information that came with your device to see if you need to install any additional software. Occasionally, a USB device isn't recognized by Windows and doesn't come with a disc containing a driver. In that case, you can try to find a device driver online. Start by checking the website of the device manufacturer—you can often download drivers from the "Support" section of such sites. When connecting a device to a USB port on a USB hub, monitor, or other device that's plugged into your computer, make sure that the USB port has enough power to support your device. Smaller devices, such as USB flash drives and mice—and devices with their own power cords, such as printers—typically work properly when connected to an unpowered USB hub. Some devices that use more power, such as USB-powered scanners and web cameras, require a hub that has its own power cord to function properly. If a device doesn't work properly when connected to a hub, try connecting it directly to one of your computer's USB ports. Devices that transfer large amounts of information, such as external hard disks, scanners, and video cameras, function best when connected to high-speed USB 2.0 ports. Some older computers might include only USB 1.x ports, or a mix of USB 1.x and 2.0 ports. If your device requires a high-speed port to function properly, check the information that came with your computer to make sure that the port you're using supports USB 2.0. If your computer includes only USB 1.x ports, you can add USB 2.0 ports by installing a USB 2.0 card inside your computer. Most USB devices can be removed and unplugged. When unplugging storage devices, such as USB flash drives, make sure that the computer has finished saving any information to the device before removing it. If the device has an activity light, wait for a few seconds after the light has finished flashing before unplugging it. If you see the Safely Remove Hardware icon in the notification area on the right side of the taskbar, you can use this as an indication that devices have finished all operations in progress and are ready to be removed. Click the icon and you'll see a list of devices. Click the device you want to remove. Windows will display a notification telling you it's safe to remove the device. No response yet to "Install a USB Device in Windows Seven"